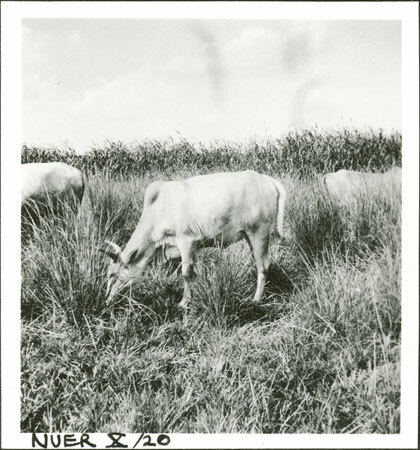 An ox grazing in lush grasses close to permanent water. The film number suggests that the location is Yakwach village on the Sobat. In contrast to his two earlier fieldwork visits when photographing cattle was viewed suspiciously by the Nuer, Evans-Pritchard took numerous record images of them during his later field trips. Note on print reverse ms pencil - "43 5 A54" & print front border ms ink - "NUER X/20"
Morton, Chris. "Nuer ox" Southern Sudan Project (in development). 03 Jan. 2006. Pitt Rivers Museum. <http://southernsudan.prm.ox.ac.uk/details/1998.355.458.2/>.